One of the trends of the contemporary orthopaedic science is the search for implantation materials for large bone defect management [1-4]. Man-made materials have been frequently tested for this purpose. Implants made of stainless steel, cobalt chrome alloys, ceramics, titanium and titanium alloys have been mostly used or trialed [5-9]. Such materials should be inert relative to live tissues, non cancerous, mechanically strong, and be resistant to the effects of the environment of the organism. Products made of carbon comply with such requirements. The first attempts to use carbon in medical practice were made at the beginning of the last century. Carbon implants started to be used widely in 1970s . However, the interest to their application ceased gradually. Apparently, it was due to the fact that carbon implants for medical application were produced from the carbon materials designed for industrial purposes, featured an enhanced mechanical strength and lacked porous structure that is required for bone tissue ingrowth into the implant. Since 1990s, the interest to carbon materials has been growing due to the developments that changed and improved their strength and osteointegration properties [11-18]. A technology has been developed for producing a nanostructured carbon material that can be adapted to manufacture implants for medical use (NanoTechMedPlus Ltd, Velikiy Novgorod, Russia) (Certificate of the Federal Inspection in Russian Healthcare # RZN 2014/2080 dated 10/31/2014). 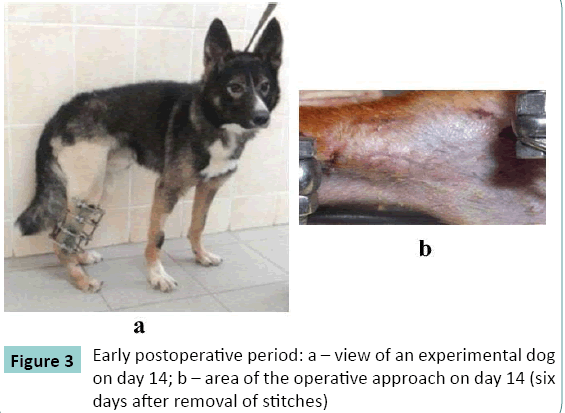 Our experiment on a canine model was aimed at obtaining scientific findings on the ability of a nanostructured carbon implant (NCI) to provide osteointergration and safety for possible use in the management of circular long bone diaphyseal defects. The experiment was conducted between May 2014 and May 2015. Eighteen dogs in the age of one to 3 years with the body weight from 14 to 16 kg and the tibia length within 14 to 16 cm were included into the experiment after they had passed through a quarantine period of 45 days for absence of chronic and acute diseases. Circular tibial diaphyseal defects in the right hind limb were formed in group 1 (n=9) and group 2 (n=9) that measured 10 mm (9%) and 20 mm (16%) of the initial tibial length respectively. The hind right limb was fixed with the Ilizarov apparatus consisting of four supports (Figure. 1). A defect was formed through a medial longitudinal incision. A NCI of the size of the defect was placed into the gap of each dog. The wound was sutured with knot stitches. 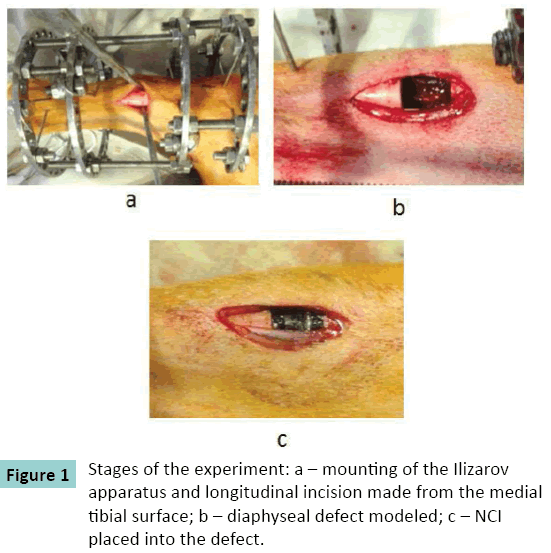 Figure 1: Stages of the experiment: ÃÂ° – mounting of the Ilizarov apparatus and longitudinal incision made from the medial tibial surface; b – diaphyseal defect modeled; c – NCI placed into the defect. The NCI tested (NanoTechMedPlus, Velikiy Novgorod, Russia) has a cylindrical shape with the diameter that is close to the diameter of the canine long bone diaphysis (Figure. 2). The NCI length sizes are 10 and 20 mm. Its cylindrical ends are 5 mm long and have a smaller diameter in order to introduce them into the intramedullary canal for fixation. The NCI has a porous structure. The pores are rectangular; each side of the pore measures from 400 to 600 μm. Figure 2: View of the NCI for placement into a long bone diaphyseal tibial defect. All surgical procedures were performed by one team in the conditions of an operation room. Sodium thiopental in the recommended dosage was used for anesthesia. Antibiotics were prescribed for one week after the operation. The dogs were kept in individual boxes, received standard balanced meals and clean water for drinking. Time points (TP) of the study were before the operation (TP0), immediately after the operation (TP1), and then at four (TP2), twelve (TP3), and 26 weeks (TP4) after the operation. General health examination (body temperature, frequency of respiratory movements, heart rate), changes in the behavior, visual changes in the condition of hair-covering, skin, meal and water consumption were checked daily. Radiographs were taken in two standard views (AP and lateral) at ?P0, ?P1, then monthly, and at ?P4 with the use of VEP X Technology Premium VET system (Spain). The structure of the shadows at the junction of bone fragments with the implant as well as the structure, extension and intensity of shadows on the bone fragments and on the implant surface were studied. Spatial implant stability in the defect gap was also estimated by clinical tests. Biochemical tests were conducted for activity of alkaline phosphatase (ALP) and bone isoenzyme of acid phosphatase (tartrate resistant) (TRACP), for the content of total calcium (Ca) and nonorganic phosphate concentrations in the blood serum at ?P0, ?P2, ?P3, ?P4 as means of assessment of the efficiency of the implant material under trial. The NCI safety was judged by activity of aminotransferases (ALT, AST) as well as by the concentrations of total protein, urea, glucose, triglycerides, sodium (Na), potassium (K), and chlorides (Chls) in the serum using an automated biochemical analyzer Hitachi/BM 902 (Hoffmann-La Roche Ltd, Roche Diagnostics GmbH, Basel, Switzerland) with the reagent kit of Vital Diagnostics (Vital Development Corporation, St. Petersburg, Russia) and Hitachi/BM 902a. Concentrations of Na, K, and Chls were estimated with the ion selection method using an ion selection system of the biochemical analyzer. Microscopic study of the intact NCI microstructure was conducted with a scanning electron microscope (SEM) JSM-840 C (JEOL, Japan). Three dogs from each group were sacrificed for a histological study at TP2 and TP4 (12 dogs in total) with intravenous injections of lethal dosages of sodium thiopental. Bone-to-NCI blocks were studied with a scanning electron microscope JSM-840 ?. The content and distribution of osteotropic elements (??, ?) was estimated with an X-ray electron probe microanalyzer INCA-200 Energy (Oxford instruments, UK). Statistical study defined the mean values and standard deviations (?i±SD). The significance of differences in the findings at TPs was estimated using the Wilxoson-Mann-Whitney test for independent samples. The study was approved by the ethics board of the institution. Interventions, animal care and euthanasia conformed to the requirements of the European Convention for the Protection of Vertebrate Animals used for Experimental and other Scientific Purposes (Strasbourg, 18.03.1986); to the criteria outlined in the Guide for Care and Use of Laboratory Animals (US National Academy of Sciences, 1996), as well as to the RF laws. General health of the animals was satisfactory during the entire period of the experiment. There were no notable changes in the consumption of food and water or behavior. Three dogs in group 1 and four dogs in group 2 had a mild soft tissue swelling in the area of the operative approach for 4 days; hematoma was present in three of them. These complications did not have any impact on the results. Sutures healed by primary intention. Stitches were removed on the 7th day. Connective tissue scars were of pink color (Figure. 3). Two dogs in group 2 developed infection in the postoperative scar in the early period of up to seven postoperative days. Administration of antibiotics was repeated and infection stopped. The dogs started partial weight bearing within three to four days and completely loaded the limb by day 14 (Figure 3a). Rejection or mechanical breaks of the implant did not happen. Biochemical studies (Table 1) revealed that the dogs of both groups did not have any significant differences in the activity of TRACP, concentrations of total calcium and nonorganic phosphate versus the initial findings at all time points. At TP2, both groups showed a significant growth in the activity of ALP, a marker of bone formation. Mean values of total protein, urea, triglycerides, K, Na, and Chls concentrations as well as the activity of transaminases were close to the initial values at all experimental time points and significant shifts were not revealed. A significant difference in a mean glucose level (not exceeding the upper normal level) was noted in group 1 at TP3. Note: bold type are the values of significant differences as compared with preoperative findings (ÃÂ<0.05). Table 1: Biochemical findings at the experimental time points (ÃÂ¥i± SD). Radiographs at TP1 showed that the leg axis was correct in all the dogs. The length of the tibia was equal to its preoperative length. The ends of bone fragments had even contours. The gap between the fragments corresponded to the size of the NCI implanted. The NCI was not visualized in the radiographs (Figure. 4). Figure 4: X-rays of the tibial defect at TP1 (NCI is not visualized as it is radiolucent). At ?P2, all dog of group 1 and six dogs of group 2 had similar radiographic findings (Figure 5 a, b). There were shadows of periosteal response that were 1.5 to 3 mm wide and 3.5 to 7 mm long that started from the ends of the fragments. Three dogs of group 2 had weak signs of reparative osteogenesis: the shadows were about 1 mm wide and 2 mm long. Figure 5: X-rays of the tibial defect at TP2: a – group1; b – group 2; at TP3: c – group1; d – group 2. At ?P3, the radiographic study showed that the axis of the tibia was aligned in all the cases. The contours of bone fragments were becoming uneven and unclear (Figure 5 c, d). A strong bone-toimplant block was formed at the junction with NCI in two dogs of group 1 and in two dogs of group 2. Shadows of newly formed bone covered the implant surfaces along its extension on all the sides. The clinical test in these dogs did not detect any mobility at the junction of bone fragments with the implant. In order to do a clinical test, the nuts that connected the rings were released and bending efforts were applied to the area of the NCI contact with the bone. The apparatus was removed in these dogs. In the other dogs, the extension of the shadows of bone regeneration at that period increased only by 3 mm. Stiff pathological mobility was detected in the contact area with the implant. The NCI-to-bone block was formed in two dogs of group 1 after four months, and in the remaining ones by TP4. Intact NCI microstructure was composed of cylindrical bars that were 1.5 mm in diameter. Each bar included microbars that were up to 8.5 μm in diameter. Amorphous mass of globular structure was seen between the bars and microbars. Rectangular pores were visualized between the bars which sides measured from 400 to 600 μm (Figure. 6). Figure 6: Structure of the intact NCI: a – bars that are oriented at different angles (mag. 22x); b – microbars that are connected with an amorphous component (mag. 1700x); c – an NCI pore (mag. 20x). The histological study at TP2 showed similar findings in both groups. In the contact area, there was an active osteointegration of bone matrix into the NCI structure, both from the periosteum and from the bone fragments. A more active osteogenesis was observed on the periosteal surface and it was more expressed in group 1. The extension of the periosteal bone tissue on the NCI surface was from 3 to 7 mm irrespective of the size of the defect. However, the dogs of group 1 had a 1.5-fold higher concentration of Ca in the newly formed periosteal bone (8.75 weight percent) as compared with group 2 (5.83 weight percent). Also, the process of osteointegration was more active at the junction of the NCI with the bone in group 1. It was expressed by a 1.5-fold increase of Ca content in this zone (4.5 weight percent) as compared with the dogs of group 2 (2.25-3 weight percent). Integrated microvessels, adhered osteoblasts, and bone substance that surrounded them was visualized in the NCI pores in both groups (Figure. 7). Figure 7: Expressiveness of osteointegration in various zones of NCI by TP2: a – a capillary between the NCI bars (SEM, mag. 550x); b – an active osteoblast in the middle part of NCI (SEM, mag. 4200x); c – bone matrix synthesis between the microbars (SEM, mag. 900x). An uninterrupted compact bone layer was formed all around the NCI surface at TP4 in group 1 (Figure. 8 a). It was more compact closer to the fragments ends (14-15 weight percent) while it was less compact in the middle circumferential areas (8-9 weight percent). At TP4, this cortical layer was interrupted in some areas along the NCI in group 2 (Figure. 8 b). Cone-shaped layers were observed in some areas on the NCI surface closer to the fragments ends that were from five to 7 mm wide. Closer to the fragments ends, an uninterrupted compact layer had the content of Ca equal to 12.5 weight percent while it was 7.5 weight percent in the layer located on the NCI middle surface. Osteogenic cells and microvessels were detected in the NCI pores. 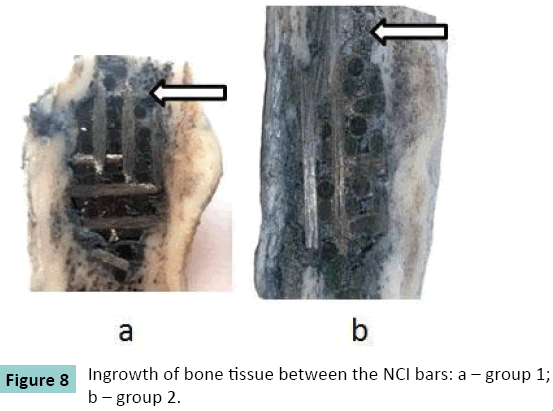 Figure 8: Ingrowth of bone tissue between the NCI bars: a – group 1; b – group 2. The previous studies on the use of contemporary composite materials for management of bone defects obtained the results that proved the possibility of using the materials that contained carbon in bone plasty and reconstructive surgery . The human bone represents a composite material that features a reinforcing base (ossein) and a connecting matrix (calcium salts). Basing on the studies, an innovative technology of producing a strong porous carbon composite material has been developed. It contains a reinforcement base (carbon bars) and a nanostructured carbon matrix. The matrix is porous; each side of the pore measures between 400 and 600 μm. The physical characteristics of the NCI that has been tested for defect management (density, breaking point by stress or strain, elasticity modulus) approximate it maximally to the main biomechanical features of the human bone. The results of our study correspond to the findings of a number of authors and confirm that carbon materials meet the basic requirements that have been posed to implants . The analysis of our clinical examination and biochemical studies showed a high degree of NCI biocompatibility, its sufficient mechanical strength, and absence of toxic or cancerous effects. Its architecture promotes adhesion of osteogenic cells, ingrowth of microvessels and fibrous component into it. Several authors described that when carbon compounds contacted with the bone tissue, a thin weakly absorbed protein layer appeared on the carbon material surface that develops into connective and bone tissues . The implant itself plays the role of a mechanical support and is a porous scaffold for ingrowth of blood vessels and penetration of bone cells . There forms a strong bony block at the junction of the bone and implant as the result of the osteointegration process. It took a mean period of 22 weeks for building of such a block in our experimental canine model of circular tibial diaphyseal defects that measured 10 or 20 mm using the NCI. As expected, bone formation process was more active in a smaller defect (10 mm). It was confirmed by radiographic and morphological studies. The defects of 20 mm that corresponded to 16% of the anatomical length of the canine tibia could be considered large if happen in the human tibia. Osteogenesis by Ilizarov traction has long been used for diaphyseal defects in long bones. However, the classical bone transport using a circular external fixator is associated with a number of complications such as wire-tract infection, pain, bone infection, joint stiffness, scars, and injuries to nerves and vessels. Discomfort felt by the patients wearing the Ilizarov apparatus should be also taken into account. A very important issue is the fact that large diaphyseal defects that are often formed in oncological cases or high energy trauma are not easy to fill in due to a lower regenerative ability of the diaphysis as compared with the metaphysis. The above facts have been the reasons for the researchers to look for other options in large defect management, including our team. The use of NCI would eliminate the complications mentioned above. 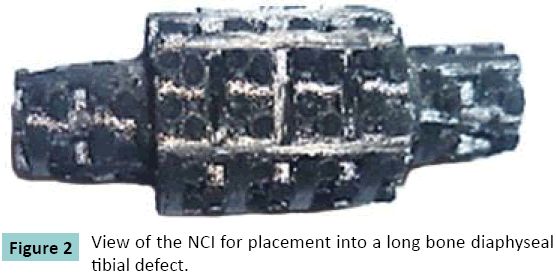 The operation includes an exposure of the defect area, NCI introduction into the defect with regard to its size. Limb fixation could be realized basing on the surgeon’s preference, either with an external fixator or plates. A combined external fixation and plating could be also trialed with the aim to study the possibility of earlier removal of the external fixator (with plating left for reducing the time of external fixation). A possible variant could be intramedullary nailing in case the NCI is made with a central hole for a nail. In conclusion, our experiment has demonstrated that the NCI tested meets the requirements to the implants used for introduction into a living organism. It is not toxic, is not rejected, and does not affect the general health. The bone-to-implant block is formed in the early postoperative period. Bone tissue gradually covers the NCI and penetrates inside its pores building direct connections between its surface, internal structures, and bone fragments. The NCI can be recommended for clinical trials as an implant to be used for bone defect management as an alternative to other options. This preclinical trial was conducted with the financial support from NanoTechMedPlus Ltd (Velikiy Novgorod, Russian Federation). Parsons JR, Ricci JL, Alexander H, Bajpai PK (1988) Osteoconductive composite grouts for orthopedic use. Ann N Y AcadSci 523: 190-207. Cowan CM, Soo C, Ting K, Wu B (2005) Evolving concepts in bone tissue engineering. Curr Top Dev Biol 66: 239-285. Andani MT, ShayestehMoghaddam N, Haberland C1, Dean D2, Miller MJ2, et al. (2014) Metals for bone implants. Part 1.Powder metallurgy and implant rendering.ActaBiomater 10: 4058-4070. Agarwal R, GarcÃ­a AJ2 (2015) Biomaterial strategies for engineering implants for enhanced osseointegration and bone repair. Adv Drug DelivRev . PihlajamÃ¤ki HK, Salminen ST, Tynninen O, BÃ¶stman OM, Laitinen O (2010) Tissue restoration after implantation of polyglycolide, polydioxanone, polylevolactide, and metallic pins in cortical bone: an experimental study in rabbits. Calcif Tissue Int 87: 90-98. Bhat A, Dreifke MB, Kandimalla Y, Gomez C, Ebraheim NA, et al. (2010) Evaluation of cross-linked chitosan microparticles for bone regeneration. J Tissue Eng Regen Med 4: 532-542. Calvo-Guirado JL, MatÃ©-SÃ¡nchez JE, Delgado-Ruiz RA, Romanos GE, De Aza-Moya P, et al. (2014) Bone neo-formation and mineral degradation of 4Bone.Â® Part II: histological and histomorphometric analysis in critical size defects in rabbits. Clin Oral Implants Res . Yang J, Chen HJ, Zhu XD, Vaidya S, Xiang Z, et al. (2014) Enhanced repair of a critical-sized segmental bone defect in rabbit femur by surface microstructured porous titanium. J Mater Sci Mater Med 25: 1747-1756. Yang X, Wang D, Liang Y, Yin H, Zhang S, et al. (2014) A new implant with solid core and porous surface: the biocompatability with bone. J Biomed Mater Res A 102: 2395-2407. Benson J. (1971) Elemental carbon as a biomaterial. J. Biomed. Material Res. 5:44-46. Guiral J, FerrÃ¡ndez L, Curto JM, Basora J, Vicente P (1990) Carbon and polyester fibers as a scaffold for bone repair. Studies of segmentary implants in the rabbit radius.ActaOrthopScand 61: 16-20. Curtin W, Reville W, Heapes M, Lyons J, Muckle D (1994) Thechondrogenic potential of carbon fiber and carbon fiber periosteum implants: an ultrastructural study in the rabbit. Osteoarthritis Cartilage 2: 253-258. Boriani S, Bandiera S, Biagini R, De Iure F, Giunti A (2000) The use of the carbon-fiber reinforced modular implant for the reconstruction of the anterior column of the spine. A clinical and experimental study conducted on 42 cases. ChirOrganiMov 85: 309-335. Qiu YS, Shahgaldi BF, Revell WJ, Heatley FW (2002) Evaluation of Gateshead carbon fibre rod as an implant material for repair of osteochondral defects: a morphological and mechanical study in the rabbit knee. Biomaterials 23: 3943-3955. Castranova V, Schulte PA, Zumwalde RD (2013) Occupational nanosafety considerations for carbon nanotubes and carbon nanofibers. AccChem Res 46: 642-649. Liao CZ, Li K, Wong HM, Tong WY, Yeung KW, et al. (2013) Novel polypropylene biocomposites reinforced with carbon nanotubes and hydroxyapatite nanorods for bone replacements. Mater SciEng C Mater BiolAppl 33: 1380-1388. Wujcik EK, Monty CN (2013) Nanotechnology for implantable sensors: carbon nanotubes and graphene in medicine. Wiley Interdiscip Rev NanomedNanobiotechnol 5: 233-249. Kenar H, Akman E, Kacar E, Demir A, Park H, Abdul-Khaliq H, Aktas C, Karaoz E. (2013) Femtosecond laser treatment of 316L improves its surface nanoroughness and carbon content and promotes osseointegration: An in vitro evaluation. Colloids Surf B Biointerfaces.108:305-312. Ekstrand K, Ruyter IE, Wellendorf H (1987) Carbon/graphite fiber reinforced poly(methyl methacrylate): properties under dry and wet conditions. J Biomed Mater Res 21: 1065-1080. Iumashev GS, Lavrov IN, Kostikov VI, LopattoIuS, Miaskovskaia SP (1983) [Use of carbon materials in medicine (review of the literature)]. OrtopTravmatolProtez : 62-64. Burlakov S.V., Oleynik V.V., Vishnevsky A.A., Gordeyev S.K (2012) Experimental validation and clinical application of combined bone-carbon implants and bone autografts for anterior spinal fusion in tuberculous spondylitis. J Spine Surg. 4:59-64.